If you didn't already know it, I can be a bit of a kook when it comes to food. I'm clearly thinking about it, sometimes stewing about it, even when I'm asleep. Many times I wake up with either a fully formed food idea in my head, or a food clue rattling around. By now I've learned enough to know that a follow-up in the cold light of morning is usually a good idea. 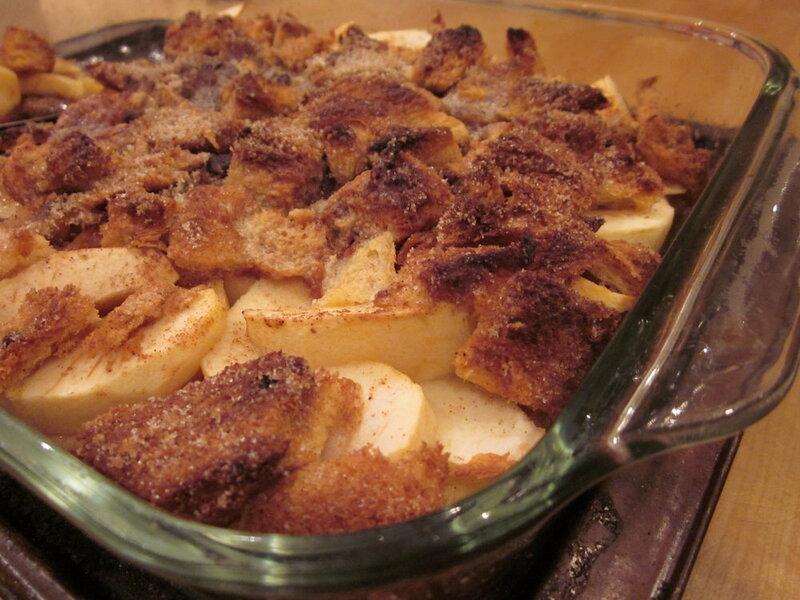 In this instance, in preparation for Felix's fall break homecoming, I woke up with apple pandowdy on my mind. Not knowing exactly what constitutes a pandowdy, I had a grand time with my cookbooks trying to figure it out. What I learned is that pandowdy is decidedly American, dating from around 1880 and is, effectively, an apple pie made with the crust broken up half-way through the baking and then pressed intothe pie filling. This is called "dowdying" in fact. Anyway, while I was dallying with dowdying, I followed an offshoot of my research into apple brown Betty which in fact, became the ultimate result of my diligence. British crisps and crumbles are obviously cousins of brown Betty, however, she seems to be American and have become popular in the late nineteenth century. The crusts in brown Bettys are formed from a thick blanket of bread crumbs, however, from what I could gather, cake crumbs could only make it more sumptuous. At that point of my reading, I remembered that in the basement on my pantry shelves I had lurking, embarrassingly, three small panettones from last Christmas that have made me cringe every time I glanced at them. So lovely and surely so stale! Suddenly Brown Betty was going to absolve me from my guilt and give me something new and interesting with which to welcome home the college boy. Never having had anyone else's apple brown Betty, I can't really judge how mine rated in comparison. However, I can testify that the candied fruit in the panettone--orange, citron, lemon zest and raisins-- were a fabulous addition to what might otherwise have been a rather plain-Jane Betty. The new creation was a great success and I'm delighted that we're in the thick of apple harvest and that I've still got two panettones to go! What a delight. In fact, this year when I go searching for my boxing day panettones (when they're so reduced they're practically giving them away) I won't give my purchase a second thought. I'll know I'm being savvy and practical and that they'll have a happy use in October when the apples come in, and not only in my dreams. Preheat oven to 375 degrees. Butter a shallow baking dish ( I used a 9 x 13 Pyrex one) and set aside. In a small bowl combine the panttone cubes, brown and white sugars and spices. Prepare the apples dropping the slices into a second bowl and tossing with a little lemon juice so they don't turn brown. Scatter 1/2 cup of the crumb mixture into the bottom of the baking dish. Top with 1/2 of the fruit. Pour the cider over and scatter slightly less than 1/2 of the cake mixture on top. Dot with about 1.2 of the butter. Top with the remaining fruit, the remaining crumbs and the remaining butter. Bake until the cake cubes are nicely browned and the fruit is bubbly and tender, about 35 minutes. Cool briefly on a wire rack and serve warm with ice cream or gelato.